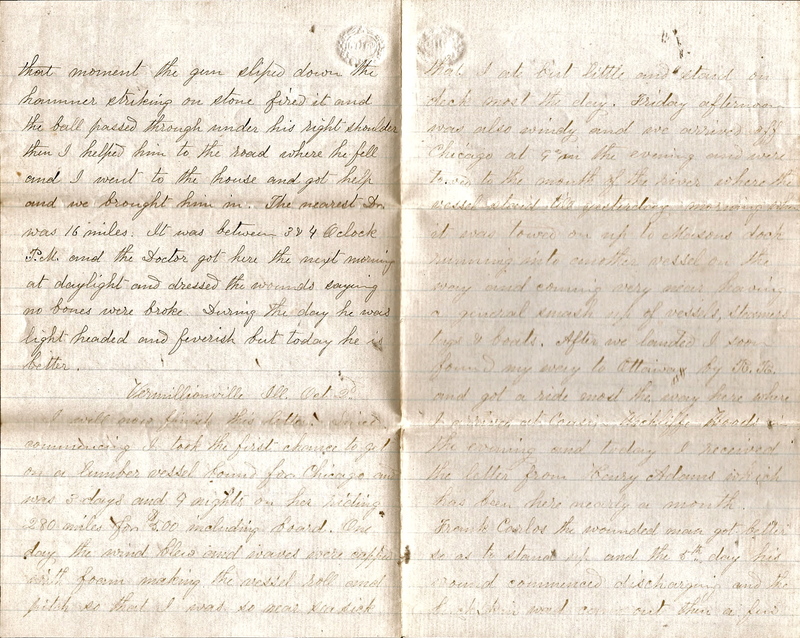 This letter was written by Theodore Day (b. 12 November 1837 in New Jersey; d. 4 December 1916 in Wayne County, PA). He was the son of Edwin S. Day (1810-1866) and Fidelia Gleason (1810-1861). 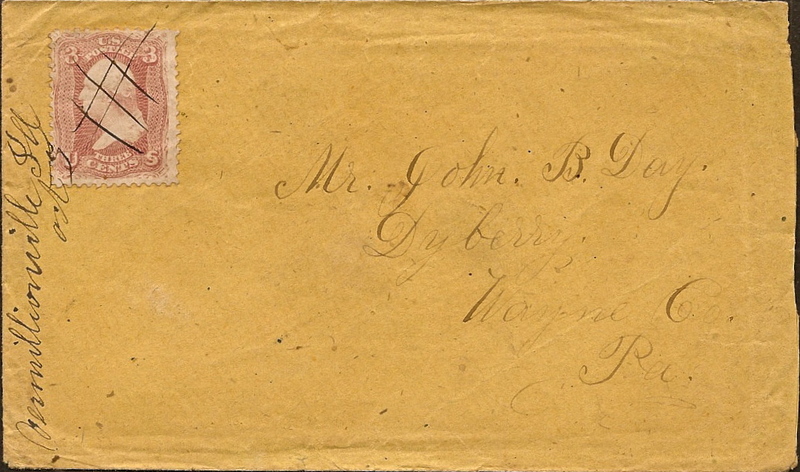 Theodore wrote the letter to his younger brother, John B. Day (b. 1849) and other members of the family living in Dyberry, Wayne County, Pennsylvania. In response to Lincoln’s call for troops to put down the rebellion in 1861, Theodore enlisted on May 13th with many other young men from Wayne County. So many men from Pennsylvania had enlisted by that time, however, that the State’s quota was filled so Theodore and his colleagues were put into the 6th Pennsylvania Reserves, Co. C. (35th Regiment PA. Volunteers). This unit was utilized for guard duty and state defense. Later in the war, the unit was utilized in combat, suffering casualties at South Mountain, 2nd Bull Run, Antietam, Fredericksburg, and in the Wilderness Campaign, but this was long after Theodore obtained a medical disability discharge signed by the regimental surgeon on May 10, 1862. 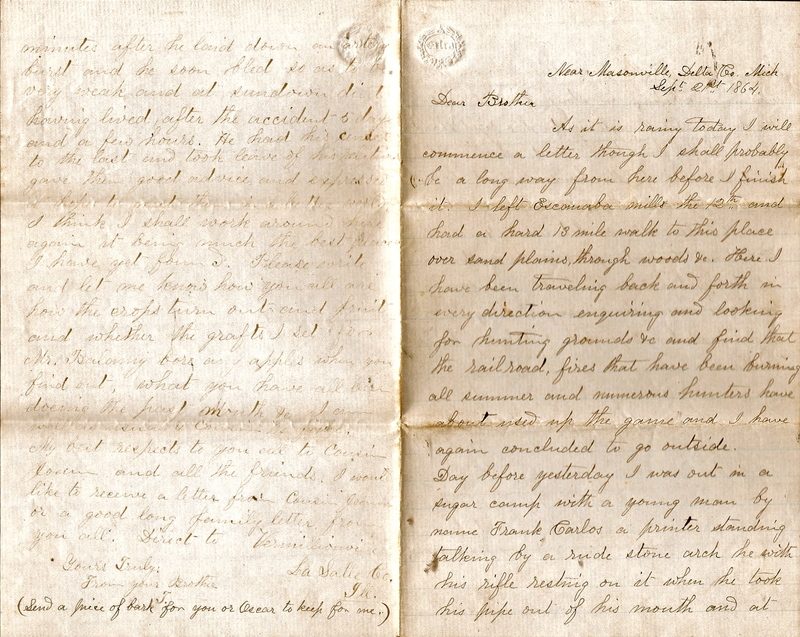 The nature of his disability is not described but it appeared not to prevent his mobility as judged from this 1864 letter. By 1870, Theodore had returned to the family farm in Wayne County, Pennsylvania and, later that year, he married Hester Dodge (1834-1893). It is conjectured that Theodore went to Illinois to avoid being judged physically eligible to return to duty or to be drafted. The first part of this letter was written from Masonville in the Upper Peninsula of Michigan while apparently on a hunting trip. The second part of the letter was written from Vermillionville (not to be confused with Vermillion), Illinois. Vermillionville is in Lasalle County, a few miles below Ottawa. In this part of the letter he describes his journey from the Upper Peninsula of Michigan by way of a lumber boat down Lake Michigan to Chicago and then by Railroad to Ottawa. As it is rainy today I will commence a letter though I shall probably be a long way from here before I finish it. I left Esconaba Mills the 12th and had a hard 13 mile walk to this place over sand plains, through woods, &c. Here I have been traveling back and forth in every direction enquiring and looking for hunting grounds &c. and find that the railroad, fires that have been burning all summer, and numerous hunters have about used up the game, and I have about concluded to go outside. Day before yesterday, I was out in a sugar camp with a young by name Frank Carlos – a printer – standing [and] talking by a rude stone arch; he, with his rifle resting on it. When he took his pipe out of his mouth, at that moment the gun slipped down, the hammer striking on stone, fired it and the ball passed through under his right shoulder then. I helped him to the road where he fell and I went to the house and got help and we brought him in. The nearest doctor was 16 miles [away]. It was between 3 & 4 o’clock P.M. and the doctor got here the next morning at daylight and dressed the wounds saying no bones were broke. During the day, he was light headed and feverish but today he is better. I will now finish this letter. Since commencing, I took the first chance to get on a lumber vessel bound for Chicago and was 3 days and 4 nights on her riding 280 miles for $5.00 including board. One day the wind blew and waves were capped with foam so that I was so near seasick that I ate but little and staid on deck most of the day. Friday afternoon was also windy and we arrived off Chicago at 9 in the evening and were towed to the mouth of the river where the vessel staid till yesterday morning when it was towed on up to Mason’s Dock, running into another vessel on the way, and coming very near having a general smash up of vessels, steamers, tugs & boats. After we landed, I soon found my way to Ottawa by R.R. and got a ride most the same way here where I arrived at Cousin Wickliffe Woods in the evening. And today I received the letter from Henry Adams which has been here nearly a month. Frank Carlos – the wounded man – got better so as to stand up and the 5th day his wound commenced discharging and the buckskin was coming out. Then a few minutes after he laid down, an artery burst and he soon bled so as to be very weak and at sundown died, having lived after the accident 5 days and a few hours. He had his senses to the last and took leave of his relatives, gave them good advice, and expressed a hope to meet them in a better world. I think I shall work around here again, it being much the best place I have yet found. Please write and let me know how you all are, how the crops turn out and fruit, and whether the grafts I set for Mr. Balamy bore any apples when you find out, what you have all been doing the past month &c. I am well as usual & cousin W’s folks. My best respects to you all, to Cousin Jo____ and all the friends. I would like to receive a letter from Cousin Jo____ or a good long family letter from you all. Direct to Vermillionville, LaSalle Co., Ill.